Made in both Spain and the New World, patriotic and commemorative coat and cuff link buttons were very popular among Spanish soldiers and civilians alike. While not items of regular military issue, the frequency and popularity of their use by military personnel dictates the appropriateness of their inclusion in this study. These personal adornments were used and may be discovered at any Spanish peninsular or colonial activity area, and certain types also saw widespread use in North America's English colonies. These buttons tend to fall within three broadly defined categories: facsimiles of Spanish coinage and Spain's royal coat of arms; portrait busts of Spanish rulers; and religious symbols and themes. A single cuff link consisted of two small, matched buttons with raised, perforated ("drilled") shanks connected by thin, elongated wire loops. Examples of two complete cuff links are shown at the top of this page as examples. In use, the looped wire components that connected the link buttons frequently broke or split, and the separated buttons were subsequently lost or discarded. Individual cuff link buttons are far more frequently encountered than complete links, and there are many subtypes of these forms. By far the most commonly used and widely distributed of the types presented were facsimiles of Spanish coinage or miniatures of the Spanish royal crest. 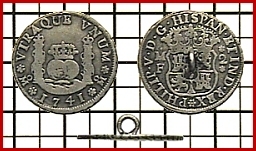 Rarely, genuine coins were converted into buttons via the addition of a simple looped wire shank, although this was no doubt a practice reserved for people of above average means. The first of these forms appear to have been introduced during the 1730s, during the reign of Felipe/Phillip V (r. 1700-1746), Spain's first Bourbon king. The last of this family of patterns that has been thus far observed was made during the reign of Carlos/Charles III (r. 1759-1788). HALF DIME: 1/2 real or *one-half bit. * It was a common practice to cut Spanish coins into pie-shaped wedges or pieces to make change; an eight real coin, for example, could be cut into eight pieces valued at one real each. Each of these pieces was referred to as a "bit", and each "bit" was a wedge-shaped piece of silver equal to 1 real in metal weight and monetary exchange value. All artifact photographs feature 1/4"/0.635cm gridded backgrounds. Most of the illustrations on this page are colorized foil rubbings made on castings of the original artifacts. This technique has been employed to visually enhance the minute details that appear on the examples depicted. 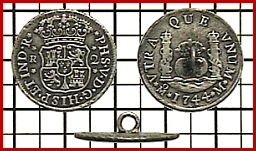 Recovered from a mid-eighteenth century Spanish shipwreck site off the coast of Cuba, these silver two real coins of 1741 and 1744 were converted into coat or jacket buttons via the addition of silver wire looped shanks attached to their hosts with silver solder. Similar examples have been recovered from ground sites in eastern North America and elsewhere. Such examples would have been restricted in use to men of means. Note that the buttons' shanks were placed to display opposite sides of the respective coins' faces. Made of copper that was originally lightly gilded, this copy of a 1764 Mexico City Mint pillar dollar once mounted a now-absent looped wire shank in the raised mound, or "boss," on its reverse face. A similar example from St. Augustine, Florida bearing the date 173– (the last numeral is illegible) reposes in the Emilio collection in the Essex Institute in Salem, Massachusetts. This specimen was recovered in eastern Florida. This sturdily made white metal alloy button was recovered near St. Augustine, Florida. Its original heavy gauge copper wire shank is still imbedded in its reverse raised boss. Bearing the date 1744, its columns bear abbreviations of the words "PLUS/ULTRA" that appear on period coins of the realm. 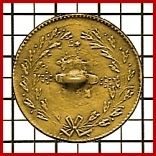 The "Pillar Dollar" coin device was the product of New World colonial mints; Spain did not produce coins bearing this design. This brass coat button represents an 8 real coin made during the reign of Spanish King Carlos III (r. 1759-1788). Rather than being date-specific, this and smaller cuff link buttons (see below) were stock patriotic button patterns made over a period of years in honor of this popular sovereign. Damaged by its long repose in a highly mineralized environment, this button has a conventional brazed loop shank configuration. Recovered from Pensacola, Florida (left) and eastern Florida (right), these brass cuff link buttons are miniature versions of the coat sized version shown above. 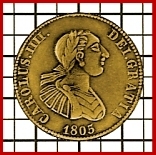 The word "CAROLVS" (Carolus) that appears on these tiny and meticulously crafted coin buttons is the Latin version of Carlos (Spanish) and/or Charles (English/French) and the root of such other names as Carlotta, Charlotte, Carl, Karl, Carol, and Caroline. This cast brass cuff link button's device mimics the reverse design of a Mexico City mint eight real coin variety produced during the 1772-1803 period. Believed to have been made in peninsular Spain, this example was probably made during the latter portion of the period cited. 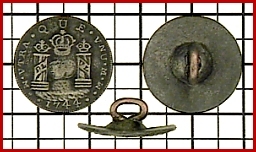 Made from cast pewter (above, left and right) and brass (above, center), these dated, facsimile coin cuff link buttons' central devices consist of the symbol of Spain's global empire. Beneath the Spanish crown, two worlds — the old and the new — are flanked by the Pillars of Hercules, the ancient name for the Straits of Gibraltar, the channel that separates the Atlantic Ocean from the Mediterranean Sea through which Spain's merchant and military mariners sailed to reach the Western Hemisphere. These pillars gave rise to the English nickname for Spain's eight real standard of silver currency: the "Pillar Dollar." All the examples shown date from the period of Carlos III's reign. Though this pillar and seal design appeared in 1772 on Spain's New World colonial coins and not until 1821 on Spanish peninsular silver coinage, these cuff link button forms were used in both Spain and its colonies. It is possible that coin buttons of this pattern were exported from Mexico or elsewhere in the New World for use in Spain. The examples shown at left and right are back marked "M / B" and "A / H" respectively, placing their probable dates of manufacture after 1790. Gold coins bearing the device consisting of the Spanish royal coat of arms surrounded by the chained collar of the Society of the Golden Fleece were made in both the old and new worlds, as were, presumably, cuff link buttons bearing this impression. The Order of the Golden Fleece was established in 1430 by the Duke of Burgundy and control of the society passed to the Spanish branch of the House of Hapsburg, the ruling house of Spain, in 1516. Although this device first appeared on Spanish eight escudo gold coins in 1728 and on gold coins made in Mexico City's mint in 1732, these brass (left and right) and silver plated (center) examples were probably made during the ca. 1790-1810 period. All of these examples bear back marks comprised of raised Roman text initials, the button on the left being marked "C / M" and the center and right specimens exhibiting the letters "M / B". Coat and cuff link buttons bearing portraits of Spain's rulers which predate the reign of Carlos/Charles IIII (r. 1788-1808) have not been observed, and the great majority of the cuff link buttons recovered were made during the exile (1808-1813) and subsequent reign (1814-1833) of Fernando VII, son of Carlos IIII. The cuff link buttons manufactured during the 1808-1814 period can truly be classified as patriotic entities. During this period, Spain was embroiled in its Guerra de Independencia — its War of Independence — against the armies of Napoleonic France and Joseph Bonaparte, whom Napoleon had named to become the new king of Spain after his maneuvers of coercion and intimidation caused Carlos IIII to abdicate and young crown prince Fernando to relinquish his claim to the throne. In exile, Fernando became a focal point of Spain's patriotism and resistance. Regiments bearing his name were formed at home and abroad, and buttons and tokens were issued and worn to promote patriotic fervor among Spain's domestic and colonial populations. During the period of Fernando's exile, coin and button diemakers had no portraits of the young prince upon which to base their likenesses of him. As a result, both Spanish coins and patriotic buttons made during this period show Ferdinand only in abstract (and often generically shapeless) representational silhouette form. After the expulsion of the French and Fernando's return and coronation in 1814, the coins and cuff links of the realm bore much more realistic representations of his features than did their predecessors. Unfortunately for Spain, this long-awaited sovereign and his policies proved to be extremely unpopular in his New World colonies, many of which had already begun to fight for their independence from Spain during the period of his exile. Indeed, Fernando VII was considered by many of his contemporaries to be both inept in administration and arrogant in demeanor. It was during his reign that Spain lost all its colonies on the American mainland, with Mexico winning its independence and Florida being annexedd by the United States in 1821. The last portrait bust cuff link buttons appear to have been made during the early years of the reign of Fernando VII's successor, Isabella II (1833-1868). Although these postdate the Spanish colonial period in North America by at least twelve years, the occasional example's recovery in once-Spanish territory attests to some lingering patriotism for and loyalty to the mother country on the parts of at least a few of Spain's former subjects in the New World. This generously proportioned coat button was made in 1805 in honor of Spanish King Carlos IV. The button appears to have had its original shank removed and then later replaced. This unexcavated example was probably made in France. These patriotic cuff link buttons, like Spanish coins of the period, show Crown Prince and later King Fernando VII only as an abstract representation. During the 1808-1814 period, when he was in a state of exile from his homeland, no accurate portraits of him could be produced by diemakers who had never seen him or a picture of him. It was also during this period that Spain was embroiled in a vicious War of Independence from the occupying armies of Napoleonic France, and, at the same time, many of Spain's overseas colonies were beginning to stage rebellions of their own against Spanish rule. These subtypes' raised Roman letters comprise the motto "FERN• / •VII•." Differing from other, similar types only in the presence of a superscript letter "O" after the "FERN" of "Fernando," these forms represent patriotic cuff link buttons made and used during crown prince Fernando's exile from Spain during the 1808 to 1814 period. Exhibiting much more accurate likenesses of Fernando VII than their predecessors, these cuff link buttons were made after his return from exile in 1814. The examples at left and center are from Spain; the example at right was recovered in eastern Florida. The button shown at far left is an intermediate type probably crafted soon after 1814. Made during the reign of Queen Isabella II of Spain (1833-1868) and more than likely fabricated early in this period, this example is backmarked with the raised Roman initials "M / J". Nearly identical examples were also made of silver. Renowned for their religious zeal, Spain's peninsular and colonial populations used and wore a wide variety of emblems and images symbolizing both the nationalistic and personal aspects of their faith. Among these representations were cuff links and buttons of the types shown below. These cuff link buttons are among a large number of known variations of the same basic pattern. The central device comprises two kneeling figures paying homage to a standing crowned female figure holding an infant, representing the Virgin Mary and the baby Jesus. The central figure is standing upon a pedestal or pillar embossed with the sign of the cross, and encircling the design appear the letters "NS DEL PILAR," an abbreviation of the motto "Nuestra Señora del Pilar". This motto translates as "Our Lady of the Pillar" in English. The design represents the legendary appearance of the Virgin Mary to Saint James the Apostle, patron saint of Spain, as he was praying by the banks of the Ebro River at Zaragoza, Spain, in ca. A.D. 40. According to this legend, Mary presented James with a statue of herself on a small marble pillar and instructed him to establish a religious shrine on that spot. Beginning in 1681, that small, first shrine dedicated to Holy Mary was enlarged and embellished to become a church and basilica complex in which is preserved what has been represented as being the original statue and pillar presented by Mary to Saint James. The button examples shown are believed to occupy a ca. 1750-1800 temporal placement.